Qigong training manuals are an ancient and important part of Chinese culture. The earliest surviving qigong training manual is the Nei Yeh, the “Inner Training”. It was compiled in the 4th century and discusses such things as proper breathing, qi, jing and shen as well as the importance of relaxed mental stillness and physical alignments. Carrying on this ancient tradition Ted Mancuso and Narrye Caldwell have put together an outstanding modern qigong training manual titled Blossoms in the Spring: A Perfect Method of Qigong. The book presents a straightforward but beautiful qigong routine that can be done seated, standing or reclining. The routine is fairly simple to learn and the authors freely acknowledge that you can teach yourself this method out of the book. I mention that last point because some modern westerners might feel that one could not learn qigong out of a book. This has never been the view of the Chinese. Chinese, both in the past and in the present, freely acknowledge that a person of average intelligence with a little patience can learn qigong from a book. 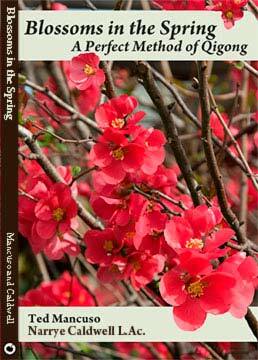 And learning from Blossoms in the Spring is made easier by the excellent photographs and the detailed text. It is a failing of many qigong books that the photos are basically useless because of their small size or poor resolution. The photographs in Blossoms in the Spring are clear and easy to see. In addition to teaching the routine, the book also has excellent background information about how to practice, discussions about the difference between attention and intention and how the practice relates to traditional Chinese medicine. The quality of the book itself is very good. It is printed on high gloss paper, it is very nicely laid out and the binding seems quite rugged. I mention that last point because some martial arts/qigong books fall apart in your hands the first time you open them up to actually use them. I highly recommend this book to anyone interested in teaching themselves a very nice qigong routine and learning a bit about the art of qigong. Brian Kennedy is a lawyer and historian with a special knowledge and focus on Chinese Martial Arts and Energetics. He is the author of Martial Arts Training Manuals, the first book in English to deal with the development of Kung Fu and Tai Chi texts and their relation to the literary world. Posted November 2, 2009 by Brian Kennedy. Comments are closed on this post, but you can trackback.